Today is Blog Action Day and rather than throw the plight of the Monarch Butterfly at you, although not something to be ignored, I thought I'd stay within the realm of design and help you to become a better graphic designer. I'm not talking about aesthetics here, I'm talking about designers and the environment. Designers use a lot of materials that are harmful to the environment, as well as depleting it by using tonnes and tonnes of paper. But there is help at hand, thanks to Caroline Clark. 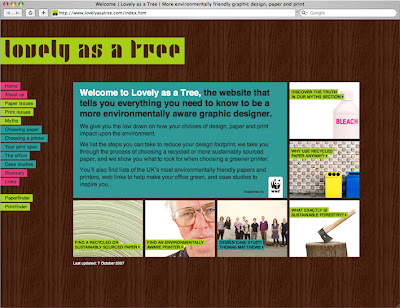 Lovely As A Tree gives you the low down and advice on how your choices of design, paper and print impact upon the environment. It's a fantastic site jam packed with ways to reduce your design footprint. There's a lot of grea information, links, advice and case studies to inspire. And I truly hope it will.